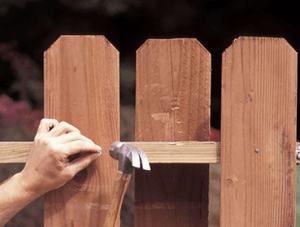 As spring arrives and summer approaches, you may have started to notice that your wood fence needs some sprucing up. Whether it is simply showing wear or it no longer compliments the color scheme of your home due to updates, there are several easy improvements you can make to personalize your fence and, in turn, brighten your entire property. Paint-Painting is one simple way to rejuvenate a shabby-looking wooden fence. Repaint the wood panels to match the trim of the house for a uniform look, or choose a dramatic color that draws attention to the property. A coat of clean, white paint will give your fence a classic look that is beautiful and eye-catching. Choose a paint that reflects your style and matches your vision. If you’re not sure about color, look at properties you admire and imitate their color scheme. Landscaping-Adding some mulch and floral accents along your fence line is another way to customize the fence itself and highlight your entire property. Flowering plants, small shrubs, and decorative grasses can be combined along the fence to create the custom look you’re going for while further defining your property lines. Custom Fence Posts– If your fence is beyond the point of a quick fix and needs to be replaced, or if you’re considering installing a new fence on your property, another option for a more personalized look is to choose custom fence posts. Choose a design, panel width, and post style that matches the look and era of your home and appeals to your taste. A custom wood fence is an attractive addition that will add to the beauty of your outdoor area. Fence by Maintenance Service is the premier, family-owned fence installation company in the Pittsburgh area. We use only fresh, high-quality wood and materials to custom build your fence on site. We offer a multitude of wood fence styles and panel widths with custom tops made specifically for each fence we install. Contact us today to learn more about what our experienced fence installation experts can do for your property!